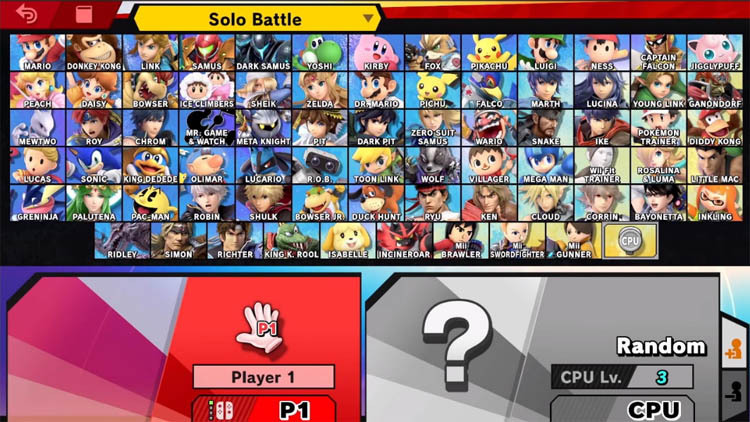 Super Smash Bros Ultimate contains 77+ playable characters, the majority of which are gradually unlocked as players progress through the game. In this guide you'll find instructions for unlocking every fighter on the Nintendo Switch roster. Many of Nintendo's famous characters make an appearance in Smash Ultimate including Mario, Peach, Donkey Kong, Kirby, Mega Man, Ryu, Ken, Link and Pikachu to name just a few. Crossover characters are also on the roster such as Sonic, Bayonetta and Snake. At the beginning of the game, players start with a default set of 8 fighters. These fighters are reminiscent of the original 8 characters from the Nintendo 64 version of Smash Bros. They are: Mario, Donkey Kong, Link, Samus, Yoshi, Kirby, Fox and Pikachu. The other 66 characters, which include both Echo and Mii characters, are unlocked by playing the game in different ways, in particular completing milestones across the various modes. 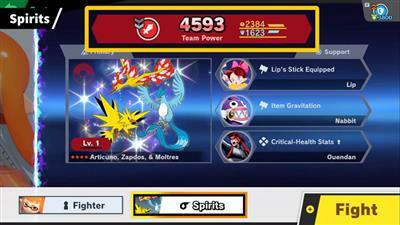 Unlike the older Smash games where the unlock requirements were often insane (many many hours of game time), the unlock requirements for Smash Ultimate are more accessible to everyone. In case you're wondering, Echo characters are as the name suggests, similar versions of existing characters. For example, the Daisy character is an Echo of Princess Peach. They are similar in appearance but offer slightly different stats. Echo characters are placed side by with their original counterparts. In the older Smash games, players unlocked characters by completing milestones such as playing x number of vs matches or performing x number of smashes. The same principles exist in Ultimate, requiring players to put in enough hard earned game time to unlock new and exciting fighters. This is true across all of the game modes such as World of Light (the new Adventure mode), Classic, Smashdown and Tournament mode. The table below contains a complete list of the 74 characters in Smash Bros for the Nintendo Switch. We do know that DLC characters are planned and these will likely be added in due course. Finally, if you would like to comment on the unlock requirements for a certain character, then feel free to use the comments section at the end of this guide. Update: Players have started unlocking characters (a week early!) and the table below has been updated with the information we know so far. It appears that playing with particular characters helps unlock other specific ones. Dark Samus WoL: The Final Battle. Classic Mode: Unlocked by Samus. Luigi WoL: World of Dark (Mysterious Dimension). Classic Mode: Unlocked by Ike. Ness WoL: World of Light (Magicant-like area). Classic Mode: Unlocked by Kirby. Captain Falcon WoL: Villager Route. Classic Mode: Unlocked by Fox. Classic Mode: Unlocked by Ness. Peach WoL: World of Light (The Molten Fortress Sub-area). Classic Mode: Unlocked by Falco. Daisy WoL: World of Dark (Defeat Dry Bowser's Spirit at Dracula's Castle before encountering). Bowser WoL: World of Light (The Molten Fortress Sub-area). Vs Mode: King K Rool. Ice Climbers WoL: World of Light, Villager route. Classic Mode: Unlocked by King K Rool. Sheik WoL: 3 Starter Pokemon. Classic Mode: Unlocked by King Dedede. Zelda WoL: World of Dark (Sacred Land). Dr Mario WoL: World of Light, Marth Route (Near Lumious City). Classic Mode: Unlocked by Roy, Bayonetta, King K Rool. Pichu Classic Mode: Unlocked by Isabelle. Falco WoL: World of Light (Space). Classic Mode: Unlocked by Peach and Captain Falcon. Marth WoL: 3 Starter Pokemon. Lucinda WoL: World of Dark (Right route, The Dark Realm). Classic Mode: Unlocked by Marth, Ryu. Young Link WoL: World of Dark (Sacred Land). Classic Mode: Unlocked by Simon. Ganondorf WoL: World of Dark (Sacred Land). Classic Mode: Unlocked by Ryu. Mewtwo WoL: Mysterious Dimension, defeat Wispy Woods spirit. Roy WoL: The Final Battle. Classic Mode: Unlocked by Little Mac. Chrom WoL: World of Dark (Sacred Land. Near a treasure chest. Press (A) on an open treasure chest.). Classic Mode: Unlocked by Ridley. Mr Game & Watch Classic Mode: Unlocked by ROB. Meta Knight WoL: World of Dark (Mysterious Dimension). Dark Pit WoL: World of Dark (Defeat Boo's Spirit at Dracula's Castle before encounter). Classic Mode: Unlocked by Wario. Zero Suit Samus Classic Mode: Unlocked by Captain Falcon. Wario WoL: World of Dark (Defeat Mummy Spirit's at Dracula's Castle before encounter). Classic Mode: Unlocked by Cloud. Snake WoL: World of Light, Marth route (Base (Metal Gear-Like area)) (Get Otacan's spirit first). Classic Mode: Unlocked by Meta Knight. Ike WoL: World of Dark (Mysterious Dimension). Pokemon Trainer Classic Mode: Unlocked by Bowser and Donkey Kong. If already unlocked Sonic, unlocked by Mario. Diddy Kong WoL: World of Light (Near DK Island). Classic Mode: Unlocked by Dark Pit. Lucas Classic Mode: Unlocked by Corrin, Ken. Sonic WoL: World of Dark (Sacred Land). Classic Mode: Unlocked by Mario. Classic Mode: Unlocked by Pokemon Trainer. R.O.B WoL: World of Dark (Mysterious Dimension). Classic Mode: Unlocked by Luigi. Toon Link Classic Mode: Unlocked by Richter. Wolf WoL: World of Dark (Mysterious Dimension). Classic Mode: Unlocked by Peach. Villager WoL: 3 Starter Pokemon. Mega Man WoL: World of Light, Marth Route (Near Sigma Spirit). Wii Fit Trainer WoL: World of Light, Marth Route (Lumious City). Classic Mode: Unlocked by Inkling. Rosalina & Luma WoL: World of Dark (Top middle route, Dark Realm). Classic Mode: Unlocked by Pokemon Trainer, Pichu, Donkey Kong. Little Mac Classic Mode: Unlocked by Bayonetta. Greninja WoL: World of Dark (Mysterious Dimension). Classic Mode: Unlocked by Rosalina. Palutena WoL: The Final Battle (Near Mythra’s Spirit). Classic Mode: Unlocked by Lucas, Ryu, Young Link. Classic Mode: If Already unlocked Jigglypuff, unlocked by Ness. Robin WoL: World of Dark (Defeat Werewolf’s spirit in Dracula’s Castle before entering). Classic Mode: Unlocked by Zelda. Shulk Classic Mode: Unlocked by Pikachu. Bowser Junior WoL: World of Dark (Sacred Land). Classic Mode: Unlocked by Falco, Donkey Kong. Duck Hunt WoL: World of Light, Marth route (Hidden Forest). Classic Mode: Unlocked by Pichu. Ryu WoL: World of Light (World Tour). Classic Mode: Unlocked by Marth. Ken WoL: World of Dark (Dracula’s Castle). Classic Mode: Unlocked by Duck Hunt. Cloud WoL: MIA World of Dark (Sacred Land. Unlock Zelda first, path will upon up to lead to him). Classic Mode: Unlocked by Dark Samus. Corrin WoL: World of Dark (Mysterious Dimension, near Azura’s spirit). Bayonetta WoL: The Final Battle . Classic Mode: Unlocked By Sonic. Inkling WoL: World of Light (Nintendo Themed City Northwest of Starting Area). Ridley WoL: World of Dark (Defeat The Creature & Flea Man spirit in Dracula's Castle before encounter). Classic Mode: Unlocked by Lucina. Simon WoL: World of Light (Near final boss). Classic Mode: Unlocked by Ice Climbers and King K Rool. Richter WoL: World of Dark (Defeat all dark spirits in Dracula's Castle before encounter. Nearby Clock Tower). Classic Mode: Unlocked by Snake and Young Link. King K Rool WoL: World of Dark (Mysterious Dimension, near Risky Boots spirit). Classic Mode: Unlocked by Link. Isabelle WoL: World of Light, Villager route. Incineroar WoL: World of Dark (Left Route, The Dark Realm). Classic Mode: Unlocked by Wii Fit Trainer. Mii Brawler WoL: World of Dark (Sacred Realm. Complete a puzzle involving red and blue torches). Mii Swordfighter WoL: World of Light, Villager route (Town). DLC Update: Piranha Plant is a pre-order bonus but can also be purchased through the eShop. Note: This guide will be updated with unlock requirements in the days following release. Stay tuned!